Home » Gout: what is it and what can I do about it? We define Gout by the build-up of uric acid crystals in the joints. You can neither see nor feel these crystals, but a physician can extract some fluid from the affected joint with a needle and analyze it under a microscope. If your doctor finds these typical uric acid crystals, you suffer from gout. What is the difference between rheumatoid arthritis (RA) and gout? The main difference between these two conditions lies in their cause. In fact, uric acid crystals do not cause any rheumatoid arthritis symptoms. Rheumatoid arthritis is a chronic inflammation of several joints (it is often symmetrical, e.g. affecting both feet, hands or arms), whereas gout generally only affects one joint (sometimes more than one). Gout and rheumatoid arthritis are also treated in two completely different ways, so these conditions should not be compared. The build-up of uric acid crystals results in inflammation, which, in turn, causes a painful and often severe joint inflammation known as a gout attack. This usually happens very suddenly, during the night. The affected joint hurts a lot and appears swollen. The skin is red and warm to the touch, and the patient can develop a high fever. A gout attack may last less than a day, but in some cases it can even last longer than a week. Once the attack is over, a nagging pain can persist for a while. As such, this condition differs from osteoarthritis, in which the symptoms tend to return every day, for example when getting up in the morning. At times, symptoms may even spontaneously decrease or increase, but in any case, osteoarthritis does not cause the same severe ‘attacks’ as gout. When uric acid crystals deposit themselves in the skin and in the subcutaneous tissues, lumps of encapsulated crystals can form. These are the famous ‘gout tophi’. They usually appear on the toes, fingers, auricles and elbows. Uric acid crystals can also deposit themselves in the kidneys and form kidney stones, which can cause severe pain in the loins, groin and back. 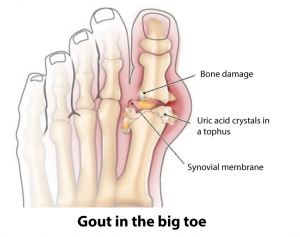 How does gout affect daily life? A gout attack is very painful and as such, it definitely affects daily activities. Patients cannot sleep comfortably and might even need help getting dressed. They might be unable to carry out certain tasks, and have difficulty exercising and practicing sports. An elevated concentration of uric acid in the blood. If uric acid can no longer fully dissolve in the blood, it deposits itself in the form of crystals. People suffering from obesity or kidney dysfunctions, heavy drinkers and people taking bladder medication are more at risk. The consumption of organ meat, red meat, certain shellfish, a lot of soft drinks and juices can also contribute to the formation of uric acid crystals. The condition may also be hereditary, particularly among people with high blood pressure, diabetes and high cholesterol levels. Acute gout attacks are about eight times more common among men than women. Moreover, gout tends to affect women at a later stage, because female hormones have a protective effect against this condition. This effect disappears following the menopause, which is why many women are affected by gout at this stage. Gout becomes more common with age, both for men and women. My knee hurts. Could it be gout? Pain in the knee can have many different causes. (Beginning) osteoarthritis is a relatively common cause, unlike gout. But let’s have a closer look at the symptoms of gout in the knee. My foot hurts. Could it be gout? To find out whether you have gout in your foot, go through the list of symptoms above, applying them to the foot. You can also use this method for gout in the big toe or in any other joint. If you suffer from gout in the foot or in the big toe, it may even hurt to cover the affected area with a bed sheet, due to extreme sensitivity. In 75% of cases, the first gout attack occurs in the big toe. Subsequently, some people only suffer the occasional gout attack. This is mild gout, which can pass when the patient changes his diet, for example by cutting out alcohol and (if necessary) by losing some weight. If patients also have tophi, and heart and kidney failure, for example, it is difficult to find the right medication. Tophi can burst, revealing a white substance. These wounds do not always heal easily and they can even lead to bacterial infections. The rheumatologist can prescribe colchicine, which reduces inflammation in the joint. Other anti-inflammatories are also an option, as is a treatment based on corticosteroids, such as prednisone. If gout is not treated, the gout attacks may become more frequent and the condition can become chronic. 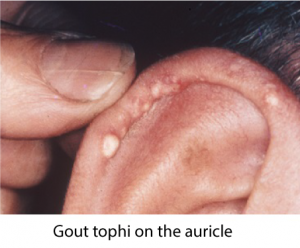 If a patient suffers three or more gout attacks a year, or has gout tophi, the uric acid levels in the blood need to be lowered through medication. This also reduces the number of gout attacks and prevents the joint damage from worsening. What can I do to reduce the symptoms of gout attacks? When you suffer a gout attack, you need to drink plenty of water and cool down the affected joint. If you have been prescribed medication, follow your rheumatologist’s advice to ensure the symptoms do not get any worse. Also have a look at our dietary advice below. As mentioned earlier, drink a lot, preferably water, 2 to 3 litres a day! By spreading your water intake evenly throughout the day, your body can remove any excess uric acid more easily. Avoid products that promote body acidification. You can find more information on this topic via Google. Avoid foods with a high purine content, as it has been proven that purines can cause gout. By avoiding purine-rich foods, you may even lower the number of gout attacks you suffer. However, this is not always the case. Contact your physician for custom advice on this matter. A few examples of purine-rich foods are trout, salmon, crab, anchovies, herring, buckling, sardines, smelt, asparagus, cauliflower, spinach, mushrooms, mince meat, offal (e.g. liver and sweetbreads), liver sausage, gelatine and leavened products such as Marmite. Products that contain lower, yet still considerable amount of purines, are duck, chicken, beef, veal, lamb, pork, game, perch, cod, mackerel, haddock, plaice, sole, shrimps, lobster, mussels, oysters, artichoke, celery, corn, legumes, soy beans, leek, peanuts, flaxseed, sunflower seeds, currants, raisins and ketchup. Lean meat often also has a higher purine content. Keep your alcohol consumption as low as possible. Do not drink every day and when you do, stick to one glass, because alcohol increases the levels of uric acid in the blood. If you suffer from obesity, you will benefit from losing 5 to 10% of your body weight. However, do not lose weight too quickly, as this has a negative impact on the uric acid levels. In a nutshell, keep your weight under control, but do so wisely. Consider taking a Blackcurrant leaf supplement. Does the weather influence the symptoms of gout? Some people notice their gout attacks are more frequent in warm weather. This is because the risk of dehydration is higher in warm weather, which, in turn, increases the risk of a gout attack. Add alcohol consumption to the equation and the risk increases even further. It is therefore strongly advisable to drink even more water on warm days or during intense activities that cause you to sweat. 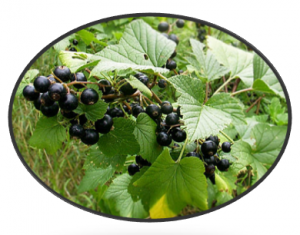 Blackcurrant (Ribes nigrum) leaf is traditionally used to excrete uric acid. It can therefore be useful to take a Blackcurrant leaf supplement to reduce the number of gout attacks you suffer. Some gout sufferers have reported a considerable decrease in symptoms when using a liquid supplement containing Green-lipped mussel, Curcumin and Blackcurrant leaf. However, since this treatment has not been extensively tested in gout sufferers, it is difficult to estimate whether or not this effect would apply to all gout patients. Do you suffer from gout and have you tried this liquid method? Let us know! Also have a look at our FAQs. In question no. 6 gout is also mentioned as an example of a disorder that has not yet been extensively tested.